As a general rule of thumb, I use this as a means of determining whether or not I want to do business with someone. And, when I violate this, as I occasionally foolishly do, I always get burned. I truly believe Seth Godin when he says what really matters about blogging is “the metacognition of thinking about what it is you’re going to say”. I like to think that I’ve gotten my return-on-investment & hope it shows in my day-to-day activities – whether it be an email, presenting, networking and even talking to my friends and family. I could stop blogging and simply delete my domain & it’s content. But part of that metacognition is that things on the Internet never really get deleted. Part of that meta-cognition is that people will Google you & they will find stuff. So while I may not blog anymore, I thought it best to leave a timeless post. I have to admit. When I first read Dan S. Kennedy‘s The Single Most Important Habit of Successful Entrepreneurs, I thought he was being a little drastic. But since then, I’ve been more cognizant of my own punctuality and quite naturally those I interact with. Time is the scarcest resource and unless it is managed nothing else can be managed. It is my conviction that a person who cannot keep appointments on time, cannot keep scheduled commitments or cannot stick to a schedule cannot be trusted in other ways either. There is a link between respect for others’ time and respect for others’ opinions, property, rights, agreements and contracts. A person reveals a great deal about himself by his punctuality or lack of punctuality. While I understand connections will go down, Windows will freeze up, Macs will spin their beach ball of death, demos will fail and traffic will jam up, I will do my best to be punctual. 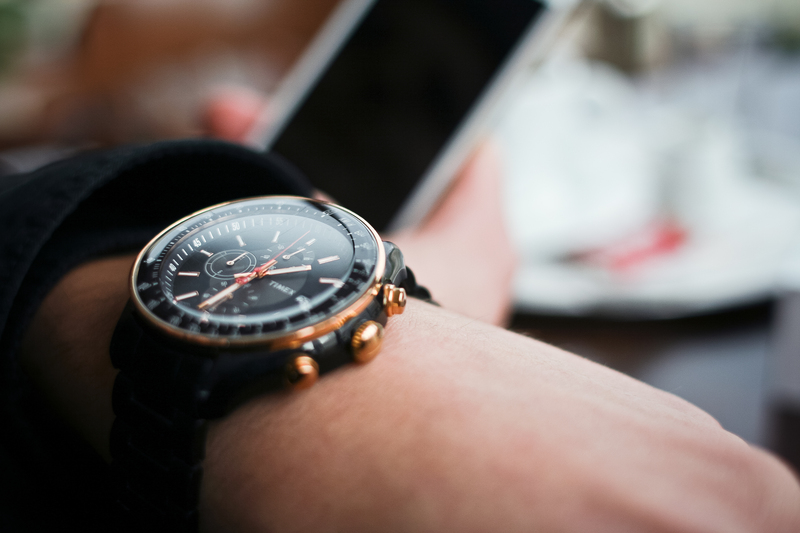 Punctual when we meet for coffee, or lunch. Punctual when I return a voice message, or, email. Punctual when I offer an introduction, or, follow-up on one. Update: I don’t know where I got this impression from but I always felt that being punctual with regard to returning email and voice messages means replying within 2 business days. I know some people feel there’s no point in replying if they’re waiting on someone else’s input, or, they don’t have an answer yet. I understand. Nonetheless, my personal preference is to reply stating that’s the case and follow-up accordingly. The funny thing about teaching, or, mentoring is that more often than not, the teacher ends up learning from the student. Such was the case yesterday when I was volunteering as a Mentor at FounderFuel‘s Mentor Day. I was talking to one of the Cohorts & they were expressing their frustration with customer acquisition. I related well to the situation where you have your Unique Value Proposition but the prospect gets bogged down in an area you perceive to be out of your problem domain. As Startups, we have to stay laser focused on what we aim to deliver & can’t afford to entertain distractions. But in this particular case, there was a pattern to what prospects were asking for, and it was a barrier for entry. Fortunately, within a few suggestions, there seemed to be a solution in sight. All without a line of code being changed and no additional costs to expanding the Unique Value Proposition. We’ll see if they experiment with the idea & the respective results, but the point is there’s a pattern here. 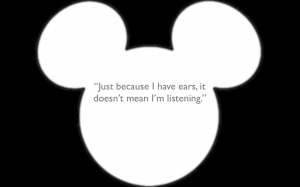 It’s the “Just Because I Have Ears, It Doesn’t Mean I’m Listening” Pattern. So I wake up in the middle of the night recalling a conversation I had earlier in the day with Chris Arsenault. Chris was asking about Menschenables.com & while he seemed to appreciate the Unique Value Proposition, was concerned about the onboarding process. 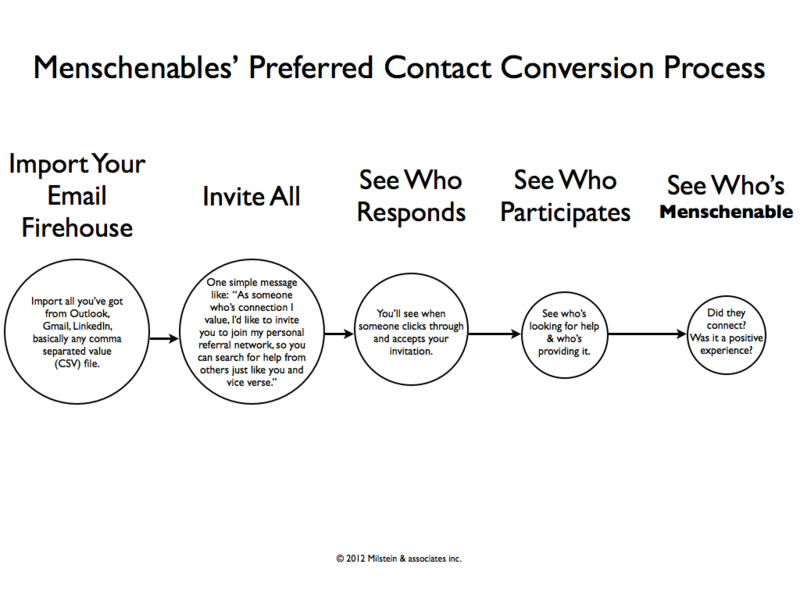 The Problem: How do I know who are my preferred contacts to invite to Menschenables.com? Are you asking me to manually go through everyone in my Outlook, Gmail, LinkedIn, Twitter, etc? The Solution: I didn’t have any because that list of preferred contacts would be a result of using Menschenables.com. Shazbut ! Later that day I was talking to Naomi Goldapple who’s seen Menschenables.com & wants to sign-up. Do you know what her problem was? Same as Chris’. Same as others interested in signing up. Why can ‘t I just import everyone & let Menschenables.com figure out who are my preferred contacts? Let’s see how folks react & take it from there. Just because I have ears, it doesn’t mean I’m listening. So I took Phil et al’s advice and modified my Unique Value Proposition just in time for an upcoming pitch to a perfect target. I opened with the above image & this story. The meeting couldn’t have gone any better. Since then, that image & one line are forever in my mind’s eye & Customer Development has never been this much fun! Apple posted this black and white image of Steve Jobs on Wednesday, Oct. 5, 2011. In general terms, volunteering is the practice of people working on behalf of others or a particular cause without payment for their time and services. Volunteering is generally considered an altruistic activity, intended to promote good or improve human quality of life, but people also volunteer for their own skill development, to meet others, to make contacts for possible employment, to have fun, and a variety of other reasons that could be considered self-serving. OK, I admit it! I didn’t volunteer for altruistic reasons. I volunteered because I’m a Starving Startup & wanted a free ticket to International Startup Festival – Montreal, Canada, July 13-15th 2011. Eight hours of volunteer work, showing people around, checking badges, setting up & tearing down venues. But it didn’t stop at eight hours. While others may have stripped out of their Volunteer t-shirt, I wore mine like a badge of honor & kept going back to Guy, asking for more things to do. It was a blast! 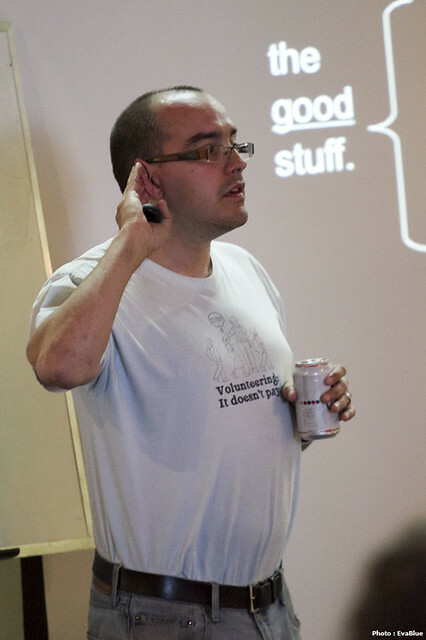 Donning the t-shirt gave me carte blanche to approach anyone, or, be anywhere. Before I knew it, I was introducing myself to familiar Twitter avatars, sharing insights & new found friends left, right & centre – even up & down! By far my favorite & long lasting experience was the Elevator Pitch. Knowing in advance how things were supposed to work, I planned my pitch very carefully; 30 seconds down to pitch & 30 seconds up, biting my tongue, absorbing feedback from investors/advisers. And as the Volunteering Gods would have it, Guy asked me to operate the elevator for 30 minutes, so I had the benefit of watching 12 other canaries in the coal mine. Montreal Startup Fest Elevator Pitches from Ondi Timoner on Vimeo. During the event, I met up with Ian Jeffrey – another volunteer, who also happens to be the General Manager of FounderFuel & a Venture Partner at Real Ventures. And while I often exchanged tweets with Ian in the past, there’s nothing better than meeting face-to-face. Which in turn probably helped when I volunteered to be a Founder Fuel Mentor. Maybe you should stop introducing yourself as a Startup and simply say what you’re business is successful at delivering. In my last post – Start Hanging Out With People Who May Have Your Solutions, I reiterated the value of Steve Blank’s “Get Out Of The Building” and Mark Suster’s post “Why You Need to Take 50 Coffee Meetings”. Here’s an example of the my Return On Investment (ROI). But as I listened to everyone else’s pitches, I couldn’t help but notice that we’re all Startups – in one form, or, another. Yes, some have established businesses behind him and some have been at this longer than I have. But in the end, we’re all pitching. We’re all searching for the right words to connect with someone listening & open the door to building a relationship. The problem with networking meetings in general – not just our’s, is that we’re usually pitching to the same crowd with a few visitors. Now I understand these meetings are more about developing long-term relationships that typically pay off over the years. But there are lessons to be learned from all these Coffee Meetings (and other events) and no reason they can’t deliver an earlier Return On Investment. That’s when I had my “Ah Ha Moment”. All I had to do was start listening to the customer & find early adopters who, not just want the service, but truly need it. Nearly All Consumers (97%) Now Use Online Media to Shop Locally, According to BIA/Kelsey and ConStat, March 2010. How many are finding you? Give us your sales pitch and we’ll connect them with you, right from your Inbox. Forget about managing search engine marketing campaigns, web sites and even qualifying the leads. Our metrics prove we can do it all for a fraction of what it would typically cost you. We are ReverseTheSearch.co. I need to work on our true customer – the supplier, landing page but that’s the big idea. From a Pivot point-of-view, there’s really no change to the core principle. In fact, we’re actually trimming away a lot of the Waste and starting over with the Minimum Viable Product. I’ll fill in some blanks with the Elevator Pitch version coming soon. But in the meantime, feel free to contact me with any thoughts. Stop staying around people who have your problems and start staying around ones who have your solutions. About a month ago, I was at local Startup Drink night and met Mohd Shahnawaz. Crying in my beer about my inability to get traction for my startup, Mohd recounted Jeffrey G. Allens’ quote & suggested I try finding events where people may actually have the skill-sets I looking for. Oddly enough, my favorite Startup Lessons Learned is Steve Blank’s “Get Out Of The Building”. Unfortunately, my myopia equated it with Customer Development & not recruiting. But as luck would have it, I had just received an email inviting me to the weekly Westmount Networking Breakfast & figured that’d be the perfect place to start. With about a dozen people in attendance, we went around the room giving our respective 60-second “info-mercials” (or, “Elevator Pitch” in geek-speak) and concluded by describing the perfect new contact we’d like to meet. Being the week after the International Startup Festival, I figured my pitch was in fine form. I figured wrong! It was met with confusion. However, it did validate that I definitely needed someone in Marketing. During the meeting & over the next week, I met with some & gathered more & more feedback. As each week went by, I tweaked my Pitch & tried my best to come up with something that not only resonated with the audience but had potential to even help some. As a techie startup, not every challenge can be resolved writing code – like Customer Development (Steve Blank). Instinctively, going out for coffee seems to align more with Lean’s definition of Waste (“Any human activity that absorbs resources but creates no value”, Taiichi Ohno, Toyota Production System.) But nothing can be further from the truth. Providing you’re not going out for coffee to listen to yourself pitch, or, drink your own Kool-aid, getting out offers huge opportunities to save precious time & resources. Recently, I started attending a weekly business networking breakfast of 10-15 regulars where we all take turns presenting what we do (Elevator Pitch) & the ideal contact we’d like to make. And while I’m the only Techie Startup, everyone else in the room is pretty much a Startup, whether they’re a Small Medium sized Business (SMB), or, an agent for a larger organization. Personally, I love presenting/pitching, so I look forward to every meeting where I could tweak & tune my Pitch, hoping it aligns better with the audience’s needs. It’s a lot cheaper to change a 60-second Pitch than to keep cranking out scalable code that customers will may never execute. For those who shy away from presenting, there’s no better place & forgiving audience to practice in front of, week after week. (Steve Jobs doesn’t wing it.) Going for coffee is not a Waste – it’s a opportunity. Blowing a face-to-face potential stakeholder (employee, business partner, customer) meeting, now that’s a Waste. Just build a _____ profitable business! In the spirit of Agile, here’s my retrospective on when we realized the primary objective is to build a business & not to get funded. Back in June 2009, I read about the TechCrunch50 2009 contest & while we barely had any running code, submitted an entry. My collaborators thought it was a bit of a stretch, but we all agreed it’s nice to set goals. So while trying to get a grip on what was required of us, I immersed myself in TechCrunch stuff. From what I understood, there was a common theme emerging – get funded & get out. And making it to the semi-finals only encouraged me. We thought we had something that was so paradigm shifting, yet so simplistically obvious at the same time, that we’d have no trouble bringing on a CEO to help us reach Jason’s Promised Land. But it wasn’t happening like that. And as time passed, we realized that if we wanted to see our dream change the world then we couldn’t wait on someone else to make it happen. That primed us for This Week in Startups #46 with David Heinemeier Hansson | ThisWeekIn. Fast forward to 1:10:45 and there you have it. It was paradigm shifting, yet so simplistically obvious. Just build a profitable business and the problem will be solved. Read his and Jason Fried’s Rework and you’ll get it too! I’m actually planning on meeting Artie next week when they present at International Startup Festival – Montreal, Canada, July 13-15th 2011 where I’ll be volunteering for my Starving Startup ticket. Stay tuned for more details about how another startup delivered an awesome experience & whether it can help us learn to build a ______ profitable business. Go out there and make some money! Not too long ago I posted about the To Pivot, or, Not To Pivot dilemma. In the end, I rationalized plotting a course towards a more fitting Minimal Viable Target Audience (MVTA) to run the next Experiment, to gather more metrics, before even thinking about the next Pivot. We are stubborn on vision. We are flexible on details…. We don’t give up on things easily. A big piece of the story we tell ourselves about who we are, is that we are willing to invent. We are willing to think long-term. We start with the customer and work backwards. And, very importantly, we are willing to be misunderstood for long periods of time. In stark contrast, just take a look at the Open letter to BlackBerry bosses: Senior RIM exec tells all as company crumbles around him. We’re staying the course! I still love it. And I still think it’s just a matter of time until we find same-minded collaborators who can help us be better understood. In the meantime, while we do have the right culture, we are coachable, we still need to focus more on the end user experience. Someone to admire and emulate, someone of noble character. The key to being “a real mensch” is nothing less than character, rectitude, dignity, a sense of what is right, responsible, decorous. While trolling Twitter for #custdev, I came across You don’t need a business plan yet: 7 ideas for Customer Development « Information Maven: Greg Meyer. I read it, liked it and retweeted it. Shortly after words, I got a thanks mention from @grmeyer. Soon enough, one tweet led to another and then Greg asked for an interview. The first thing Greg asked was “What can I do to help you?” – which surprised me because I thought Greg wanted to talk about my Nordie experience he posted on Deliver The Awesome. Not so. Greg explained he likes being an Information Maven – “a trusted expert in a particular field, who seeks to pass knowledge on to others” – as described in his About. Within moments, Greg was describing and offering to connect me with four, or, five contacts whom most likely share AnotherSocialEconomy’s Where Demand Comes to Meet Supply vision. And while it’s always nice to get feedback and introductions from someone who “gets it”, it’s even more of a delight when they come through. [contact-name], meet Steven Milstein. Steven is a Montreal entrepreneur. You should know Steven because he’s working on a way to match up qualified buyers with qualified sellers for speciifc commerce / e-commerce needs. Find out more at http://ReverseTheSearch.co. Steven, meet [contact-name]. [contact-name] is [title / role]. You should know [contact-name because he’s a good guy and has lots of experience thinking about bringing concepts to market. Find out more at [useful link]. I hope this introduction proves useful! As a <type of user>, I want <some goal> so that <some reason>. Not only were the introductions short & sweet but each were custom wordsmithed, hoping to capture how this introduction may be helpful to it’s recipients. To all my friends out there, please follow @grmeyer and @DeliverAwesome, visit and offer up your own service, or, retail experience that made you feel great. You can also follow @GregAtGist, the product marketing guy for Gist – a wild product that melds all your contacts social streams in your own Dashboard, or, my fave, email Inbox. I’ve been practicing my @grmeyer inspired Networking User Stories whenever the opportunity arises & have to report, if nothing else, it is gratifying. I’m not good at following-up, maybe because, I know people are inundated with others trying to connect & I don’t want to put anyone in the uncomfortable position of feeling they have to explain their actions, or, lack thereof to me. But based on all these networking experiences and months of various styles of breakfast meetings & coffee meetings, even this post by James Altucher – The 9 Skills Needed to Become a Super Connector Altucher Confidential, I’m really pleased to say that we’re taking apart our startup’s lego blocks & reassembling them to service the needs of power networkers. Once relaunched, we’ll be “taking the mundane out of making it rain” by facilitating half of the skills James mentioned. The postings on this site are my own and don’t necessarily represent any of my past / present / future employers', referenced organizations', clients, friends, relatives, Followers, Followees positions, strategies or opinions. Copyright © 2008 Milstein & associates inc.